Overcome potty training constipation with these simple pointers. In addressing difficulties in potty training, parents, especially new parents, will hit multiple mile markers along the way of raising their child. Many small wars most assuredly will arise in the most basic stages of childhood development. Certainly, one of the most prevalent of these a parent will face will be in the adjustment from diapers to the potty. Many factors can make potting training constipation in your child a real challenge, but do not fear! With a little bit of understanding, a lot of patience and some practical advice, potty training can be a beautiful and empowering experience for your little one. Before anything else, first, identify the problem. Is your child sincerely unable to go to the bathroom on demand, either from anxiety or physical distress? Are they ashamed of the act of using the bathroom; are you showing distress or impatience causing them to be unable to relax, making them fearful? Do they want to be the boss? Do they associate going to the bathroom as you winning and them losing? After identifying the true situation at play, you can now proceed to successful potty training. As parents strive to properly raise their children, moments will occur that may confuse the parent or create mis-communication signals between the child and the parent. These moments can cause unnecessary pain for both the parents and the child. Potting training is a pivotal point of childhood development into independence, carrying the same level of importance as learning to walk or learning to feed ones self. This is why potting training constipation in a small child can be a subject for caution, as the child will interpret their inability to perform as failure and shame. As a child, I had a lot of personal experience in potty training constipation. I have memories of being 3 and 4 years old and feeling tremendous shame and fear. When bathroom time came I experienced tremendous anxiety over not being able to release my bowels on command. My anxiety and fear then multiplied the problems of my situation, making my body contract instead of relax, escalating the moment into one where it was an impossible thing to perform. First, realize that though potty training in itself may seem like a trivial subject, it will be a mile stone in your child’s self-esteem. Parents will benefit from recognizing the power of successfully helping their child through their potty training constipation, recognizing the situation as a health problem and not a problem of the child being stubborn or rebellious. Above anything else, the parent needs to approach the child with love and compassion, gentleness and soft words. It is vital for parents not to display expressions of frustration, impatience and agitation in front of the child because of their apparent potty training constipation, as the child will interpret this as extreme failure on their part. Instead, the child and parent will both benefit by the use of soft words and high levels of patience in the moment. Though my experience was mainly caused by a stressed-induced physical inability to use the bathroom, obviously not all situations are the same. Some parents will notice the child will refuse to go out of a power struggle. First, to distinguish if this is the cause of the problem, note your child’s behavior at potty time. Does their face display shame or defiance? Many parents have reported their children actually pushing their stool back in, defying their parents’ command. This can be a part of that tricky stage of childhood development when the child begins to gain his own sense of self, stubbornly refusing the direction of the parent. When children use going to the bathroom as a tool for maintaining control, this can result in painful potty training constipation after several days of refusing to use the bathroom at their parents’ command. If this is the case, the child has established in their mind that this is what you want as opposed to what they want. So what does a parent do in this situation? To end the power struggle, put potty training temporarily on hold. Dress your child in pull-up diapers and end the struggle. When the child begins to see this is no longer “your wish”, their own understanding of this will kick in. They will realize for themselves that potty training constipation doesn't work for them: “I don’t want my tummy to hurt anymore” or “I don’t want to sit in my poop anymore”. Like all development in life, this is a great opportunity for your child to grow and mature in their sense of self. They will come out of the situation empowered as they make their own self-realization that they want better for themselves. The power struggle will end and your child will glide beautifully through the potty training chapter. At this point you may be saying, “But I don’t want to helplessly watch my child remain in pain.” There are ways to help your child walk out this process by getting busy behind the scenes. Make sure their diet is rich in fiber. Include vegetables and fruits like baked beans, potatoes, sweet corn, broccoli, peas, plums, apricots, figs, prunes. Also good are cereals with fiber and whole grain breads. Your child should drink a lot of water to help keep their stool soft. Another option is to give him or her a little fruit juice, diluted 10 to 1 with water. Avoid giving them sugary and carbonated drinks. A sea mineral supplement not only may provide much-needed nutrition, but magnesium pulls moisture into the stool, helping to eliminate constipation and produce a strong urge to go. Magnesium also offers other health benefits. Constipation can make a child sluggish. To improve the child’s ability to go, invite them to go walking with you, run in the park or just turn on some music and dance with them. This movement will encourage their bowels to relax and make it much easier for them to feel the signal to go. As a final note, remember the power of patience. 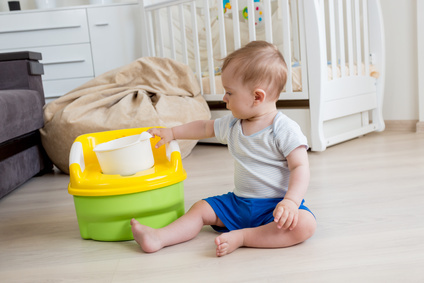 Know that you have everything you need to successfully potty train your child. It may just be a matter of time before they have successfully achieved this mile mark in their lives. Most importantly of all, enjoy the experience!